, an eminent Scotch divine, and second son of Patrick Scougal, bishop of Aberdeen, was born June 1650, at Salton, in East Lothian, where his father, the immediate predecessor of Bishop Burnet, was rector. His father, designing him for the sacred ministry, watched over his infant mind with peculiar care, and soon had the satisfaction of perceiving the most amiable dispositions unfold themselves, and his understanding rise at once into the vigour of manhood. Relinquishing the amusements of youth, young Scougal applied to his studies with ardour: and, agreeably to his father’s wish, at an early period directed his thoughts to sacred literature. He perused the historical parts of the bible with peculiar pleasure, and then began to examine its contents more minutely. He was struck with the peculiarities of the Jewish dispensation, and felt an anxiety to understand why its rites and ceremonies were abolished. The nature and evidences of the Christian religion also occupied his mind. He perused sermons with much attention, committed to writing those passages which most affected him, and could comprehend and remember their whole scope. Nor was he inattentive to polite literature. He read the Roman clas­.sics, and made considerable proficiency in the Greek, Hebrew, and other oriental languages. He was also well versed in history and mathematics. His diversions were of a manly kind. After becoming acquainted with Roman history, he formed, in concert with some of his companions, a little senate, where orations of their own composition were delivered. At the age of fifteen he entered the university, where | he behaved with great modesty, sobriety, and diligence. 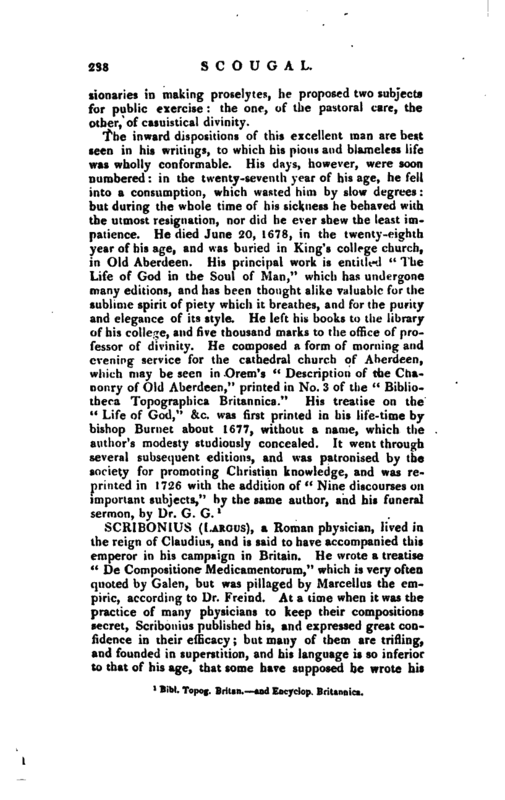 He disliked the philosophy then taught, and applied himself to the study of natural philosophy: and in consequence of this, when he was only about eighteen years of age, he wrote the reflections and short essays since published: which, though written in his youth, and some of them left unfinished, breathe a devotion, which shows that his mind was early impressed with the most important concerns of human life. In all the public meetings of the students he was unanimously chosen president, and had a singular deference paid to his judgment. 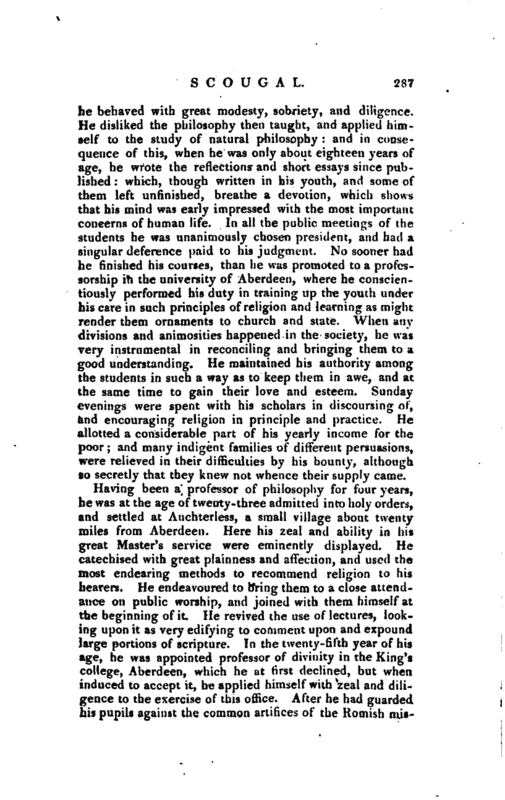 No sooner had he finished his courses, than he was promoted to a professorship in the university of Aberdeen, where he conscientiously performed his duty in training up the youth under his care in such principles of religion and learning as might render them ornaments to church and state. When any divisions and animosities happened in the society, he was very instrumental in reconciling and bringing them to a good understanding. He maintained his authority among the students in such a way as to keep them in awe, and at the same time to gain their love and esteem. Sunday evenings were spent with his scholars in discoursing of, and encouraging religion in principle and practice. He allotted a considerable part of his yearly income for the poor; and many indigent families of different persuasions, were relieved in their difficulties by his bounty, although so secretly that they knew not whence their supply came. 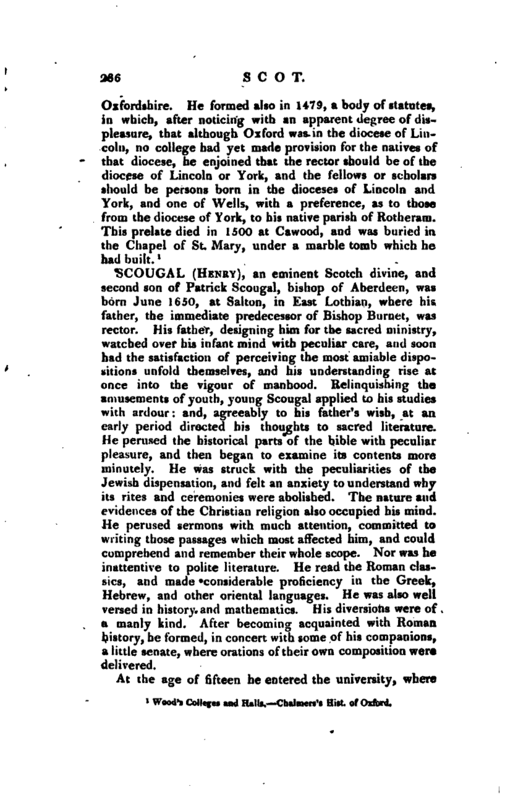 Having been a professor of philosophy for four years, he was at the age of twenty-three admitted into holy orders, and settled at Auchterless, a small village about twenty miles from Aberdeen. Here his zeal and ability in his great Master’s service were eminently displayed. He catechised with great plainness and affection, and used the most endearing methods to recommend religion to his hearers. He endeavoured to bring them to a close attendance on public worship, and joined with them himself at the beginning of it. He revived the use of lectures, looking upon it as very edifying to comment upon and expound large portions of scripture. In the twenty-fifth year of his age, he was appointed professor of divinity in the King’s college, Aberdeen, which he at first declined, but when induced to accept it, he applied himself with zeal and diligence to the exercise of this office. After he had guarded his pupils agajnst the common artifices of the Romish | missionaries in making proselytes, he proposed two subjects for public exercise the one, of the pastoral care, the other, of casuistical divinity. Bibl. Topog. Britan. and Encyclop. Britannica.